BookLust: Whatever happened to interracial love? 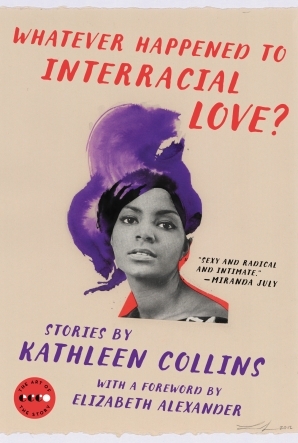 I heard about Kathleen Collins and her collection of short stories, Whatever Happened to Interracial Love?, in the New York Times Book Review, where I get many of my reading recommendations (and which has gotten better at reviewing books by people who are not white and male). Kathleen Collins was active in the civil rights movement of the 1960s, but most of her artistic work (films, plays, short stories) was produced in the 1980s. Her short stories were, for the most part, never published. Her daughter discovered them in a trunk. It's always hard to judge artistic talent by stories left unpublished in a trunk, mainly because it's hard to know if these stories were complete or if the author still wanted to work on them. But the romance of the whole situation is just too much to pass up! Undiscovered author! A trunk! The perfect cultural moment! Stories on race, gender, sexuality! It's a lot of awesomeness. If it could happen for Emily Dickinson, can't it happen for other people, too? I think it can, sometimes. But sometimes the collection can also be pretty inconsistent. I think that's true for Kathleen Collins. There is so much wit in her stories, so much that speaks to how fascinating and vibrant she must have been, how much fun she must have been to talk to. But there are other stories that feel unrefined or directionless. Whatever Happened to Interracial Love? is more a collection of what was great potential, lost too early (Collins died of cancer in 1988 at age 46). The stories are mainly pretty short, and race is alluded to in almost all of them. One story is told from the point of view of a man describing the perfect family, a close-knit unit that was beautiful, intelligent, and got along well. But then cracks start to show, and it turns out the family's future is not nearly as happy as one would hope. In another, a woman loyally sends letters and gifts to her husband in prison. When he gets out and moves to a foreign country (without her), she finds peace in a small, rural home and some new friends. In "The Uncle," the narrator relates the story of his uncle, who is ill and whom many describe as lazy for his whole life. But the narrator, upon reflection, thinks that his uncle was a hero, just for surviving.. But his weeping, wailing, and gnashing of teeth brimmed potent to overflowing in the room, and I began to weep for him, weep tears of pride and joy that he should have so soaked his life in sorrow and gone back to some ancient ritual beyond the blunt humiliation of his skin, with its bound-and-sealed possibilities; so refused to overcome his sorrow as some affliction to be transcended, some stumbling block put in his way for the sake of trial and endurance; so refused to strike out against it, go down in a blaze of responsibilities met and struggled with. No. He utterly honored his sorrow, gave in to it with such deep and boundless weeping that it seemed as I stood there he was the bravest man I had ever known. There was silver and gold in all the stories collected here, even if all of them didn't stick with me. So much about how difficult life can be when people expect so little of you, or treat you like you are less than what you know yourself to be. So much about the struggle to understand your parents or your children, about competing priorities for different generations and what they decide is worth fighting for. It's a lovely collection and well worth seeking out. Not only because it's amazing to discover the unknown work of a feminist civil rights cultural icon, but because the stories are quite good, too. I didn't know these stories were undiscovered in a trunk! Huh! I don't think it has any impact on my desire to read them -- I don't like story collections even when the author has had a chance to edit and refine them -- but HUH, what an interesting thing! I have seen this collection everywhere, I don't know how I missed this intriguing detail!